A heady mix of punk and guitar pop influences, this debut full-length proves the UK act to be exciting, catchy and highly promising. In a year full of strong debuts by good new bands from both sides of the Atlantic, Stars of CCTV by Middlesex, England's Hard-Fi, ranks among the cream of the crop. These four scrappy lads self-recorded and released seven of these songs late last year on a mini-LP (also called Stars of CCTV), before Atlantic picked them up and fronted the cash for the remaining six tracks that comprise this full-length release. But that's just a discographical footnote. And what is it that makes a band worthy of having footnotes instead of merely being a footnote? Yeah, you got it: the music! These guys weave together so many elements so well, and all within the tidy confines of a bunch of pop songs, that it's refreshingly impossible to boil down their sound to one or two key influences. A list of four (with parenthetical footnotes!) will have to do: The Clash ('cause they're a little bit punk, and make nice use of dubby flourishes), The Strokes (for Richard Archer's Casablancas-like overdriven vocals and the band's garagey sound), The Style Council (they've got that jazzy, post-new wave, blue-eyed soul working for them), and Oasis (for the huge, arena-bursting moments). The band may come across as raw and street-tough, but they're given away by the sophistication in their songwriting, their talent as performers, and their affection for perfect extra touches (a Radiohead-like guitar delay, an electronic beat, a muted trumpet). On an album teeming with highlights, opener "Cash Machine" best sums up the Hard-Fi sound: A melodica riff, a slow-grooving dance beat, big and clearly-ringing guitar stabs on the chorus, and Archer's reggae-soul vocal melody weaving throughout, as he sings about being too broke to get a tube ticket home or, more poignantly, to take responsibility for his pregnant girlfriend. This is followed by the blistering "Middle Eastern Holiday" (a soldier's story in which the "Holiday" part is, of course, ironic), which leads to the tension/release drive of the bludgeoned-by-boredom tale "Tight Up Too Tight". The obvious single is "Hard to Beat", an infectious but kind of dumb song about nothing more than flirting ("You know I love ya / Just wanna touch ya"). Still, it's catchy and provides a nice no-brains-needed mid-album break before the scorching "Unnecessary Trouble". They follow this up with, of all things, a piano ballad. Wipe any thought of Elton or Billy from your mind, though, because "Move on Now" is a beautifully sober portrait of love threatened by squalid surroundings. 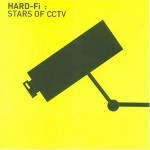 The song is a testament to Hard-Fi's writing talents and hints at plenty of room for artistic growth. The chorus to "Better Do Better" is overwrought but deliciously huge, as Archer spurns a former lover's attempt at reconciliation. The appropriately dramatic "Feltham Is Singing Out" recounts the fall of a friend from drunken partier to petty thief to a 21-year-old suicide in Feltham prison. After the unremarkable but highly hummable "Living for the Weekend" comes the moody title track, with acoustic guitar and a cheeky reminder that we're almost always being filmed in public. The bouncy pop of "Stronger" verges on filler, but the sunny T-Rex melody is just a little too hard to pass up. Hard-Fi reach their breathless conclusion with the fuzzed-out closer "Sick of It All", where the Clash meet the Bravery and go for a fast drive, snarling their dissatisfactions. Alas, this is also the point where the exciting, catchy and highly promising Stars of CCTV meets its end. Admit it: You haven't heard a note, but you're already addicted. When your first spin ends, you'll hit play again (and again, and again, and again).